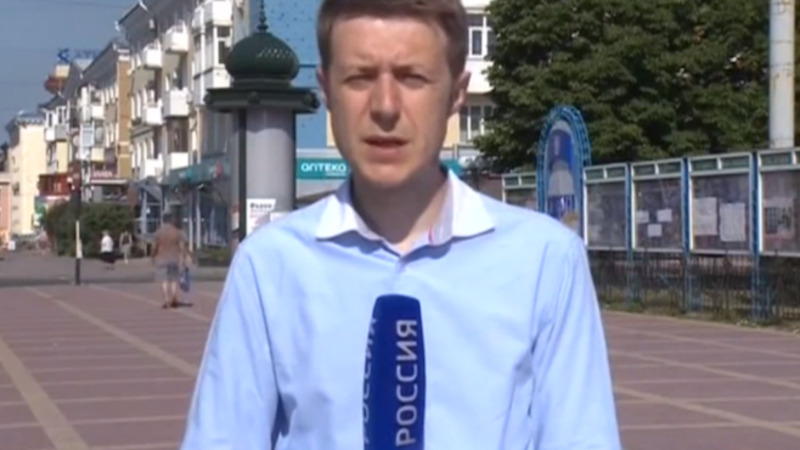 Reporter Igor Kornelyuk was reporting for state-run television network Rossia 24 at the time of the incident. Following the shelling deaths of two journalists near Luhansk, Russian officials and international organizations have called on Ukrainian leaders and belligerents to ensure the safety of journalists and other civilians. Reporter Igor Kornelyuk and sound engineer Anton Voloshin fell under mortar fire outside the village of Metalist on Tuesday while accompanying a group of refugees and pro-Russian separatists. Both men were employees of Russian public broadcaster VGTRK, and were reporting for state-run television network Rossia 24 at the time of the incident. Voloshin was killed instantly. Kornelyuk died shortly thereafter on the operating table at a Luhansk hospital. President Vladimir Putin expressed "concern" about the journalists' deaths during a phone call with his Ukrainian counterpart Petro Poroshenko Tuesday, according to a statement issued by the Kremlin. Poroshenko assured Putin that Ukraine would investigate the incident and "take the necessary measures to ensure the safety of journalists." Prime Minister Dmitry Medvedev wrote on Facebook that the Ukrainian authorities should be held responsible for the incident. Meanwhile, the UN Security Council called for an investigation into violence against journalists in Ukraine. Foreign Minister Sergei Lavrov reiterated on Tuesday Russia's condemnation of the Ukrainian authorities' "uncivilized" treatment of journalists and their "fabrication of espionage charges against them," linking the incident to broader issues in Ukrainian governance. "This case is a strong signal for Kiev's Western patrons to halt their injudicious support of violent actions and make Kiev fulfill President Petro Poroshenko's promise to begin a national dialogue with all of the regions about the country's future," Lavrov said. Johann Bihr, the head of Reporters Without Borders' Eastern Europe and Central Asia Bureau, told The Moscow Times on Wednesday that the protection of civilians was "not optional." "This is an obligation under international law," Bihr said. He warned that "a lack of clarity in the chain of command and unmarked belligerents fuel impunity in situations like these." Though Kornelyuk and Voloshin are not believed to have been targeted for their work, Bihr added that polarized media coverage and propagandized reporting have left journalists particularly vulnerable in the conflict. Five journalists have been killed in Ukraine and more than 200 have been injured since the beginning of the year, according to Reporters Without Borders. Italian photographer Andrea Rocchelli and Russian human rights activist Andrey Mironov, who was translating for Rocchelli at the time, were killed by shelling in the Donetsk region in May. Ukrainian journalist Vyacheslav Veremy died in the hospital after being shot in the chest in February following his coverage of the Maidan protests in Kiev.